I am a girl who loves a good bargain. And I'm constantly looking for a good deal. So naturally I have a love for perusing thrift stores and Craigslist for my next big find. My desk, bookshelf, coffee table and end table from my college apartment were all refurbished pieces of furniture that my roommate and I found for next to nothing at our local thrift store. And they were actually cute and well-made! In fact, one of the pieces is still in my house today, and I still get compliments on it. It just goes to show that a little bit of paint or reupholstering can go a long way. And the best part is that you're finished, you will have a one-of-a-kind piece. Here are a few before and after pictures that will show you exactly what I mean. 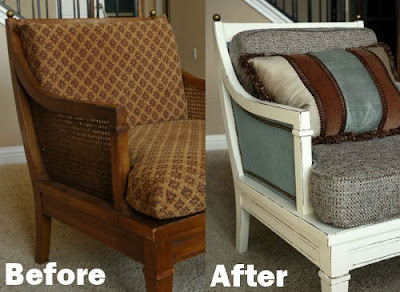 And check out this transformation featured on Living with Lindsey. This old, tiered piece, shown on Design Sponge, looks completely with a little effort and a little paint. 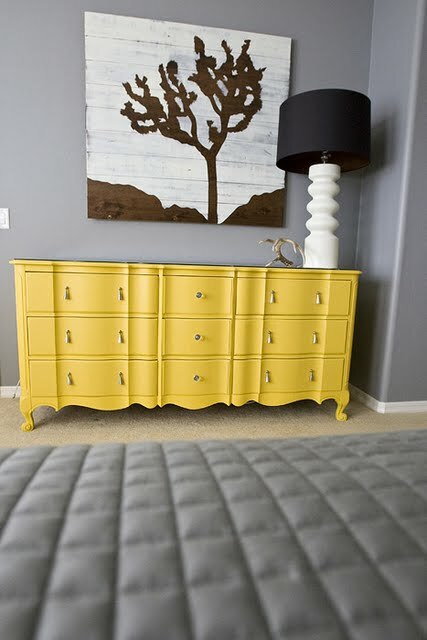 And lastly, here is a dresser redo by Michelle at Three Men and a Lady. If you don't let door pulls and other cosmetic things cloud your vision, you too can come out with wonderful piece like this. When you go shopping for your next piece of furniture, be sure to put Craigslist, thrift stores and flea markets on your list of places to checkout. You never know what you might find. And if you see something that looks too beat up or out-of-date to even think about bringing home, stop and give it another glance. If it has great lines, it has great potential.